For a long time, lobbyists used the 4G LTE rollout and -adoption discrepancy between US and Korea/Japan (on one hand) and Europe (on the other hand) as a “proof” of too rigid European telecom regulation. The basic fact that major US, Korean and Japanese operators are running CDMA2000 without the European possibility to gracefully migrate to 4G LTE was tactically neglected in this comparison. Verizon, LG Uplus and KDDI – to give one example per country – had no other alternative than to go “all in” on 4G LTE and quickly migrate customers from CDMA2000 to the new network. European operators – with WCDMA/HSPA networks capable of delivering a similar customer experience as 4G LTE – could wait until 4G LTE equipment was widely available in the right price points, thereby avoiding excessive equipment subsidisation and too early network rollout. The graph shows that Europe is now catching up on Korea, Japan and USA when it comes to reported 4G LTE population coverage. Quite many European operators are now covering a higher proportion of the population than the two trailing American operators Sprint and T-Mobile. Counter-intuitively, less populated European countries have the best 4G LTE coverage: Sweden, Denmark, the Netherlands, Portugal, Switzerland, Finland and Estonia. 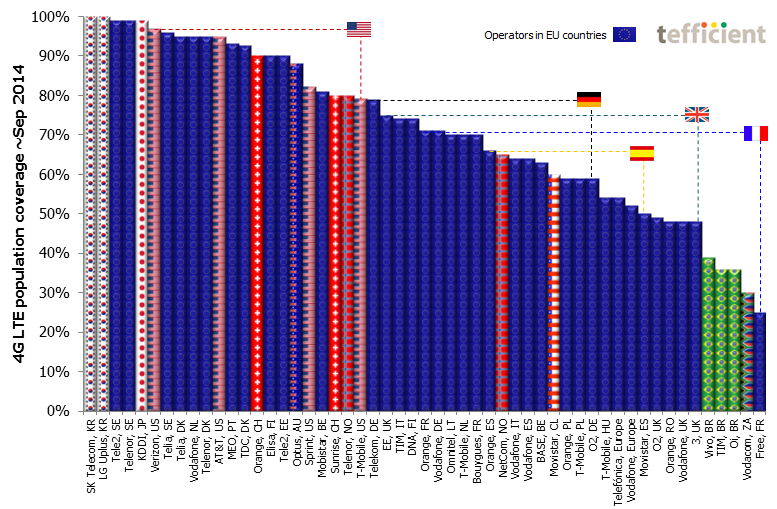 All of the operators in the most populated EU countries are behind the last US operator. The rollout spread between operators in the most populated EU countries – Germany, UK, France, Spain are highlighted – is also significant. It’s anyhow high time to kill the “Europe being behind” myth. Europe can’t yet compete with the 4G LTE rollout of Korea and Japan – but Europe can compete with the US.